On April 24th, the collapse of the Rana Plaza, a commercial building in Savar, near Dhaka, Bangladesh, claimed over 600 lives. It is considered to be the deadliest garment factory accident in history, as well as the deadliest structural failure in modern human history. The general consensus among those who have been covering and following the tragic story seems to place the majority of the blame on the building's owner, Mohammed Sohel Rana, the local authorities who allowed such a poorly built structure to be constructed and for people to work in it, and the retailers and supply chain for perpetuating those conditions for the sake of profit. However, it seems that an increasing amount of sources have decided to point the finger at the final link of the supply chain: the consumer. The BBC published a video asking whether "clothes shoppers were concerned about the disaster", with one interviewee declaring that "a lot of people don't even bother to think about child labour or cheap labour", while The Financial Post ran an article entitled "Bangladesh factories: Shoppers turn blind eye as cheap clothes win". Meanwhile, Sarah Morris, business development director of Trajectory Partnership, had similar scorn to pour on those who buy from such shops: "Just 10% of consumers are committed to shopping ethically. Around one-third of consumers are utterly disengaged from the very notion of ethical shopping". This is a very simplistic and unfair view and, in reality, the bigger picture is much more complicated than this. It cannot simply be said that consumers know that, when they go into a high street clothes shop, they actively know they are buying goods which have been made using unethical labour and, figuratively speaking, have blood in the fabric, but simply do not care, because they just want to save money. While the consumer needs to exercise a due amount of diligence when it comes to ethical shopping, it's not always that easy. Although people can be aware of the issues and make a conscious effort whenever they can to purchase goods from reputable, ethical stores, one has to take into account things like employment, commuting, and familial responsibilities, which may leave little practical time, as well as proximity to ethical outlets. In addition, ethically made garments make up a tiny fraction of 1 percent of the overall $1 trillion global fashion industry, and given the complex web of suppliers and subcontractors involved in the industry's supply chain, it's incredibly difficult for consumers to know if whether a product has been manufactured in safe conditions. Income also plays a major part in consumers' spending habits. Here in the UK, discount fashion retailer Primark has come under criticism for using one of the suppliers within the collapsed building. But in these austere times, with more and more people struggling to make ends meet and having to downscale their spending habits, they do not deserve to receive criticism for either wanting or needing to spend less. 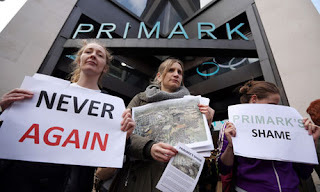 People can only buy what is put out in front of them and what they can afford, and while some are able and willing to go to great lengths to ensure their purchases are as ethical as possible, we cannot demonise all other consumers who, for one reason or another, end up buying from those other clothes retailers. So what is the answer? To boycott brands implicated in the disaster? To only buy British? Sadly this won't increase the welfare of sweatshop workers in Bangladesh, rather it will deprive them of a much needed income. The country's garment industry accounts for nearly 80% of its exports, meaning many of its people are reliant on it for their livelihoods. And of course, anyone who's truly been keeping a close eye on the issue of ethics and welfare in the industry should remember a certain documentary which aired on Channel 4 three years ago, focusing on appalling conditions in sweatshops based in the English city of Leicester. A disaster of the magnitude of the Rana Plaza collapse cannot be dismissed or swept under the carpet like so many previously - just seven months ago, a fire at a garment factory in Ashulia, outside, Dhaka, killed 112 people. Similar stories of buildings collapsing in Dhaka also killed high numbers of people, mostly involved in the garment industry, in 2005, 2006 and 2010. The fashion industry shouldn't just wait for consumers to start voicing their concerns about the welfare of the products they purchase. Given the events two weeks ago, it's pretty obvious that the operation is deeply flawed. Its corporations need to band together and implement measures as soon as possible, such as having ground staff carry out audits in the factories, as opposed to merely pushing for them as they've been doing for years with few tangible results. The UK government also needs to step in to ensure more transparency and good conduct in the supply chain to help ensure this kind of disaster doesn't repeat itself.